Any pain in the chest area, whether high up or lower down, slightly to the left or right of the midline, is naturally a cause for concern especially among adults. Considering that the vital organs like the heart and lungs are located here, breastbone pain is usually taken seriously. For some people like those who are obese, have a history of heart disease and smoke heavily, the concern is much greater. However, it is important to note that the abdomen starts much higher than most of us realize. Pain lower down in the chest area may actually be abdominal pain. The breastbone is the central bone of the chest cavity, lying on its anterior (front) wall. It serves as a point where ribs and the collarbones on either side can attach and also protects important vital organs like the heart. The top part of the breastbone is known as the manubrium, which attaches to a long body and ends with a sharp almost triangular portion known as the xiphoid process. The medical term for pain behind the breast bone is retrosternal pain. Pain below this xiphoid process or just underneath is technically epigastric pain (upper middle abdominal pain). With the abdominal cavity holding so many organs in such close proximity to each other, the cause of pain below the breastbone can vary greatly. Sometimes pain from higher up, like from the heart can also cause referred and radiated pain to this region. This video on pain below the breastbone was produced by the Health Hype team. The more common causes of pain below the breastbone has been discussed below. However, there are a number of different conditions that can cause pain in this region. It is therefore important that persistent pain, pain that is worsening or pain with other symptoms like dizziness and difficulty breathing be assessed by a medical professional. Acid reflux is one of the common causes of pain below the breastbone. Most of us expect the typical heartburn high up the torso but the moment stomach juices enter the esophagus, it triggers a burning that starts lower down where the stomach and esophagus meet. 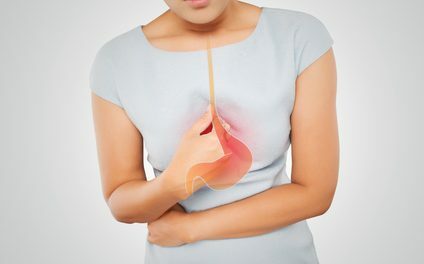 Acid reflux or gastroesophageal reflux disease (GERD) is a result of the lower esophageal sphincter (LES) being weak and not being able to hold back the stomach juices from rising into the esophagus. A common stomach condition that causes upper middle to left-sided stomach pain, gastritis is where the stomach wall becomes inflamed. Two common causes include H.pylori infection and the excessive use of NSAIDs. Since the stomach extends across from the left side to the middle abdominal quadrant, pain may be felt anywhere in this region especially if the inflammation is towards the terminal portions of the stomach. Peptic ulcer disease (PUD) is another common gastrointestinal condition that can accompany gastritis. It is largely caused by the same factors as gastritis but in peptic ulcer disease there are open sores (ulcers) in the wall of the stomach and/or duodenum of the small intestine. Duodenal ulcers are usually more common and the pain is often felt in the upper middle abdominal region. Gallstones are hard masses that form in the gallbladder from bile. These stones then may get stuck in the neck of the gallbladder or the bile ducts where it causes pain that may extend to the back and even up to the right shoulder. The pain is usually episodic, lasting for up to a few hours and tends to worsen after consuming fatty meals. In severe cases there may be a fever, chills and jaundice. Inflammation of the pancreas is known as pancreatitis and it can be either acute or chronic. Acute pancreatitis can lead to severe pain in the middle of the abdomen, just below the breastbone and it extends to the back. The pain is so severe that a person cannot stand up straight. It can be life-threatening without prompt treatment and is often associated with excessive alcohol consumption. Chronic pancreatitis is largely asymptomatic except when there are acute episodes. Blockage of the coronary arteries that supply blood to the heart wall can lead to death of a portion of the heart tissue. This is commonly known as a heart attack and the medical term is myocardial infarction. While it typically causes a severe crushing central chest pain that is slightly to the left, sometimes it may also cause pain that may be felt below the breastbone. Excessive sweating, difficulty of breathing, left arm pain and dizziness are other symptoms. 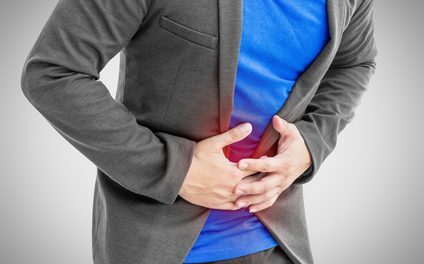 Sometime pain in the abdominal region may be due to functional gastrointestinal conditions. The cause of these conditions are unknown but it is not due to any disease. Irritable bowel syndrome (IBS) and non-ulcer dyspepsia are two types of functional disorders that can present with abdominal pain. These conditions tend to last for years or even life, and symptoms arise in episodes. Despite numerous medical investigations the cause is usually never identified. Cancer, particularly stomach and pancreas. Large colon (transverse colon) conditions like diverticulitis and inflammatory bowel disease. Pericarditis (inflammation of the lining around the heart). Pain below the breastbone is a symptom and may be accompanied by a host of other these symptoms. The collection of these symptoms may provide an indication of the possible causes. Nausea and or vomiting usually indicates a digestive disorder but may also occur with a heart attack. Bloody vomit indicates bleeding within the gastrointestinal tract like with a bleeding ulcer. Fever and chills are usually seen with infections but may also occur with gallstones. Bloating is usually due to digestive conditions but may also occur with non-digestive causes. Chest pain may be seen with acid reflux, esophagitis and a heart attack. Dizziness and sweating may occur with acute pancreatitis and a heart attack. The cause of abdominal pain can be confusing and often other investigations like an abdominal ultrasound, CT scan or MRI are needed to diagnose the underlying condition.